There are about 535.000 Francophone people in Ontario, and a flag for this community was adopted by the Association Canadienne-Francaise de l'Ontario. This simple flag consists of two panels, dark green at the hoist and white at the fly end. A white fleur de lis is set on the green panel, while a dark green stylized trillium flower is set on the white panel. The fleur-de-lis is of course the symbol of Frenchness, while Ontario's floral emblem is the symbolic connection to the province. The white trillium was adopted as Ontario's floral emblem in 1937, as a by-product of a failed effort to find a national flower that could be planted on the graves of Canadian soldiers that died abroad. The trillium is very stylized (as are also the arms of Ontario) and serves in this form as the logo of the provincial government. It looks a bit like a triquetra, a Christian symbol of the Trinity. On http://canlink.com/acfo-mi/acfo-dra.htm (link inactive) with a 'drapeau franco-ontarien' - the French Ontarian flag symbols in relationship to the whole flag are much larger. The two creators of the flag are Gaétan Gervais and Michel Dupuis, both from Laurentian University. I invite you to read the book by Guy Gaudreau published recently (2005/2006) on the history of the flag: Le drapeau franco-ontarien. The Office of Francophone Affairs of the Ontario Government informs me that the green shade used on the flag is Pantone 349. Ontario may have the second-to-worst provincial flag according to NAVA's recent survey, but the beautiful Franco-Ontarian flag was just recognized by vote on June 21 2001 in Queen's Park (Ontario's provincial parliament) as representing the province's francophone community. Members of all political parties voted for the motion presented by Liberal Member of Parliament Jean-Marc Lalonde (opposition). The flag will be raised on the Parliament building on June 24 2001, Saint-Jean-Baptist Day, patron saint of French-Canadians. Ontario will thus become the second province to fly its francophone minority's flag, after New Brunswick, which flies the Acadian flag on its Legislative Assembly. The event was well received by the community, although some influent members expressed the wish that the Conservative government did more than symbolic actions for the promotion of French in Ontario. Indeed, recently, two events made the Franco-Ontarians angry against their government. The one that mobilized most people was the government's decision to appeal of a court judgment that declared unconstitutional the decision to close down the province's only French-language hospital (in Ottawa). The second was the lack of political will by the government to declare officially bilingual the new city of Ottawa (created by the merger of Ottawa with its immediate suburbs), Canada's capital and an important cultural center for the Franco-Ontarians. (In the end, the city did declare itself bilingual, but without sanction by Queen's Park). Not to mention frustration caused by the refusal of large department stores in Ottawa to put up bilingual signs, although the same stores did so in Montreal to accommodate the Anglophone minority there. Franco-Ontarians still remember when the government tried to take their language out of their schools during the First World War. This official recognition of the flag comes three weeks before the Games of the Francophonie, which will be held in the federal capital region of Ottawa-Hull. The Franco-Ontarian flag is a vertical 1:2 green and white (representing the Ontarian Summer and Winter), with a white fleur de lis in the center of the hoist square with obvious symbolism and a green stylized trillium (the official provincial flower is the white trillium) in the center of the fly square. The flag was first flown at the French-language Université de Sudbury (today called Université Laurentienne). It was designed by a group of students from that university on the initiative of their history professor, Gaétan Gervais, and in the honor of Camille Lemieux, an editorialist, who had pledged for the adoption of a distinctive Franco-Ontarian flag in the 1950s, shortly after Quebec's flag was adopted. Until 1948, French-Canadians in Quebec, New England, Ontario and Western Canada made use of the Carillon flag, ancestor of Quebec's current Fleur-de-lis. (A common faux pas is to confuse French-Canadians and the Acadians of Atlantic Canada and Maine, who's culture and history is significantly separate). Quebec's move was in line with the shift in identity that was operating from French-Canadians to Québécois. As a result, the concept of a large French-Canadian nation dissolved and local francophone flags were adopted in North America. In 1977, the French-Canadian Association of Ontario (ACFO) adopted the flag created in 1975 and it has since flown in every French-speaking villages and towns in front of schools, Desjardins financial coops, community centers and private homes, often next to the Canadian and Ontarian flags. Americans are often puzzled by the importance given to French speakers in Canada; a past NAVA president even once told me he didn't understand why provincial French-Canadian associations bothered to adopt flags, while Italian-Canadians or other groups didn't. One has to understand that in many parts of the country as well as parts of the Northern US, French-Canadians were the first explorers if not the first settler (hence the many French place names in the Midwest like Des Moines, Joliet, Racine, Detroit, etc.). The French presence in Ontario dates back 350 years. French-Canadians never experienced the French revolution because they were under British rule by then, hence the insignificance of modern French symbols to them. In fact, the word French-Canadian itself is fairly recent; the original meaning of "Canadian" being a French descendant born in Canada. Although Ontario's native French-speaking population represents only about 5% of the province's total population (compare New Brunswick where Acadians represent close to the third), there are strong francophone concentrations in the Eastern and Northern parts of the province. More important, the half-a-million strong Franco-Ontarian community represents just over half of Canada's francophone population outside Quebec and is twice as large as New Brunswick's. The Franco-Ontarian flag was presented in 1975 and officially adopted in 2001 by the law shown below. The law gives the historical and symbolical background of the flag. The French language has been present in Ontario for 350 years. The first French speakers to come to Ontario were the missionaries who established the mission of Sainte-Marie-among-the-Hurons in 1639. The Ontario French-speaking community is the largest French-speaking community in Canada outside Quebec. French is one of the two official languages of Canada. In Ontario, it is recognized as an official language in the courts, in education and in the Legislative Assembly. For nearly 40 years, the Province of Ontario has recognized the importance of serving its citizens in French upon request. It was when the present section 5 of the French Language Services Act, an Act also known as Law 8, came into force in November 1989, that the Province recognized that its citizens were entitled to those services upon request. The Franco-Ontarian flag was unveiled for the first time on September 25, 1975 at Laurentian University in Sudbury. From then on, the Ontario French-speaking community has consistently used it as its emblem. It is therefore appropriate now to recognize it officially as the emblem of that community. "Ontario French-speaking community" means the community of persons who have the right under subsection 23 (1) or (2) of the Canadian Charter of Rights and Freedoms, without regard to subsection 23 (3) of that Charter, to have their children receive their primary and secondary school instruction in the French language in Ontario. 2. The flag described in the Schedule to this Act is recognized as the emblem of the Ontario French-speaking community. The emblem of the Ontario French-speaking community consists of two vertical bands of different colours. The first band is mid green and has a white lily in the middle of the band. The second band is white and has a mid green trillium in the middle of the band. On the emblem, green represents summer and white represents winter. Together the two colours represent the diversity of Ontario's climate. The lily evokes the French-speaking community worldwide, whereas the trillium is the floral emblem of Ontario. On 26 April 2010, the Ontario Parliament unanimously adopted Law #24, which makes of the 25 September the official Franco-Ontarian Day. This day commemorates the adoption of the Franco-Ontarian flag on 25 September 1975. During the sixties, a split emerged between the different groups that make up French Canada. In Quebec, the 'Quebec' identity replaced the 'French Canadian' one. French speaking minorities in other provinces followed suit and adapted new symbols. In 1964, amidst the debate concerning a new Canadian flag, the Ontario-based Fédération des Sociétés Saint-Jean-Baptiste proposed a flag hoping that it would be adopted across the entire province. It was an adaptation of the French Canadian one, only replacing the Sacred Heart by Ontario's floral emblem, the trillium. This flag did not win public support. As is explained on the above page, the present Franco-Ontarian flag, on the contrary, proved to be a success and was officially recognized a few years ago. Relevant facts gleaned from the "Historique" (i.e. History) section: founded in 1936 when the Union catholique des fermières (i.e. Catholic Rural Womens' Union) was organized, first under the general roof of the Franco-Ontarian agricultural movement, separate since 1961. Change to present name, 1969. The idea was to promote social, cultural, and religious interests of their members with an emphasis on crafts. Later UCFO's focus was enlarged to the social development of women and girls generally. A telling detail is the substitution of 'O' in the organization's initials by the female sign. Above mentioned flag is still found here: http://www.crccf.uottawa.ca/passeport/III/C/C1b/IIIC1b03-4-2.html. 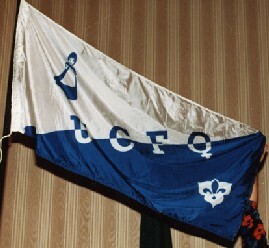 The photo shows the UCFO flag presented during the 50th anniversary festivities at Ottawa in 1986. 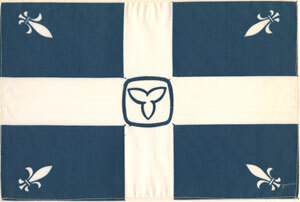 Divided along an ascending diagonal, white (hoist) and blue (fly), a picture in blue of a women in traditional dress in the upper hoist corner and a Franco-Ontarian symbol in white in the lower fly corner. Positioned over the diagonal line, in counterchanged colours, are the initials UCFO with the O transformed into the female sign. Possibly white and blue were chosen as these are the Marian colours.